I feel like I haven't made muffins in a long long time. I used to make them a lot in New York because they were easy and I would make them late at night for my kids to have fresh muffins for breakfast in the morning. (Also if helped out my husband who usually made their breakfasts in the morning, to have something that he can plop on their plates with little effort!) But since moving here I haven't had the time, or the mindset to think about muffins. Sounds weird, I know. But lately, my daughter has been making more and more requests on our shopping trips, and this time she randomly asked for strawberry muffins. I figured I could find a way to do it, so on my way out of Target, I grabbed a bag of dehydrated strawberries. I got home and did some research, and found a recipe titled "Mashed Berry muffins" and it hit me, yes! Why not? It totally made sense. 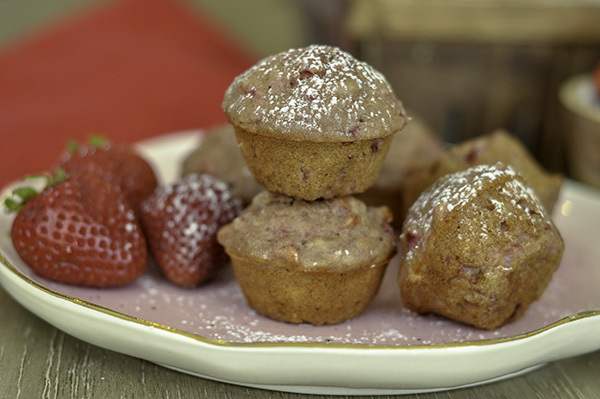 So I bring to you today... Smashed Strawberry Mini Muffins! It's taken me a while to post this recipe, but summer's been busy and I think I lost track of this one! Apologies! But now that the kids are back in school, this is the perfect recipe to make ahead for a quick grab and go breakfast! I also just found out that my daughter's school don't allow cupcakes for classroom parties, so I will also be making these for her birthday party! 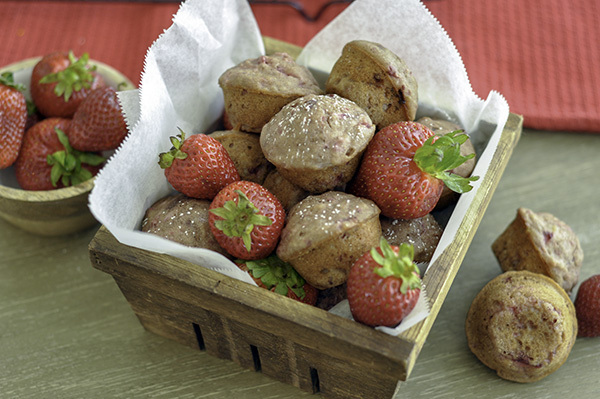 Since these are made with fresh fruit, whole wheat flour and just 1/3 cup of sugar, it's definitely got a lot of pluses in the mommy column. But with the sweet taste of strawberries, I don't think there are many kids out there who would say no to them! These muffins come together quick and easy so there's no need to stress if you're making these at night after a long day of work, as I so often did! All you need is one bowl and you're ready to go. The hardest part is cutting up the strawberries! 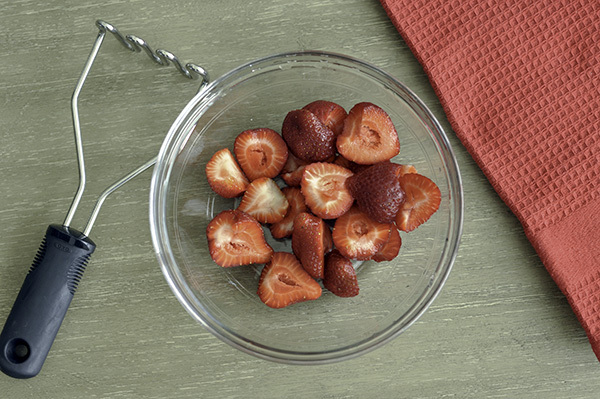 Place the cut up berries in a bowl and smash away with a potato masher or fork! Then into the same bowl goes the sugar, oil, eggs, vanilla and buttermilk. Or as bakers say... the wet ingredients. Once those are combined, it's time to add in the dry ingredients. So in goes the flours, baking soda, salt and cinnamon. Then for the finishing touch, add in the crushed dehydrated strawberries. You can find these in the snack aisle of most supermarkets or I get mine at Target! Gently fold to combine, then scoop the batter into your prepared mini muffin tins. Pop them in the oven for 9 minutes or until an inserted toothpick comes out clean. Cool in the pan for 5 minutes, then unfold onto a wire rack to cool completely. I store these on the counter for about 3 days, but you can always refrigerate then microwave for a few seconds to warm. In a medium sized bowl, Mash strawberries using a fork or a potato masher. Stir in sugar, oil, vanilla, buttermilk and eggs. Mix until combined. Using a small cookie scoop. Scoop the batter into the wells of the mini muffin tin. Bake 9 minutes or until light golden brown or toothpick poked in center comes out clean. Loosen sides of muffins from pan if needed, and take them out of the pan. Cool on a wire rack.